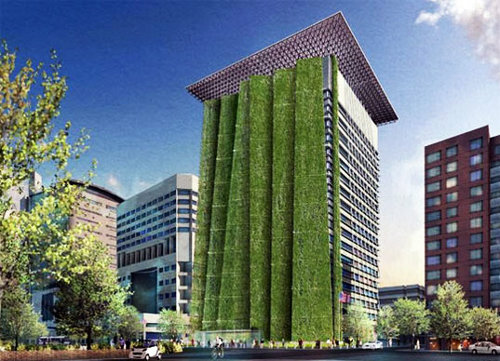 I generally like the idea of vertical gardens and urban greening. But this one planned as part of the green renovation of the 18-story federal building in Portland, Ore., profiled in this morning’s NY Times seems like a stretch. For some reason, I’m having trouble accessing the NYT site. Is that just grass growing on the vertical wall? A long stretch of green. My snark detector is whizzing. This is going to be one massive vertical garden. It’s part of a 130 million dollar budget I believe to renovate the building. But the vertical garden is going to take a huge chunk of that budget. They’d likely have to pre-grow each panel with sedums or other types of plants that can grow on walls. They also have to find plants that are able to grow 250 ft in the air which will have a lot more exposure to wind and sun. That’ll be quite the challenge.